Shri Ram Vilas Paswan, Union Minister for Consumer Affairs, Food & Public Distribution, talking to media here today said that the Government has decided to continue the same issue prices for food-grains under the National Food Security Act till June, 2018. Shri Paswan said that the details of letters and digits for display of MRP, net-quantity and consumer support on the pack of food items must be followed. 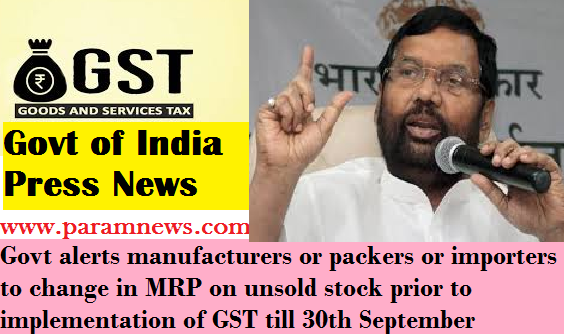 Shri Paswan informed that Government has allowed the manufacturers or packers or importers of pre-packaged commodities to declare the changed retail sale price (MRP) on the unsold stock manufactured/packed/imported prior to 1st July, 2017 after inclusion of the increased amount of tax due to GST, if any, in addition to the existing retail sale price (MRP), for three months w.e.f. 1st July, 2017 to 30th September, 2017. National Food Security Act (NFSA) – The NFSA was enacted with effect from 5.7.2013. When the NDA Government came into power in the year 2014, only 11 States had implemented the NFSA. By November, 2016 it got implemented in the entire country. Highly subsidized food-grains are provided to the eligible households @ Rs. 1/- per kg. Coarsegrains, Rs. 2/- per kg. Wheat and Rs. 3/- per kg. Rice. As per the provisions under the Act these prices shall be valid for a period of 3 years from the date of commencement of the Act and, thereafter, may be revised by the Central Government. However, the Central Government did not change the issue prices till June, 2017. Now, the Government has decided to continue the same issue prices under the Act till June, 2018. This decision will benefit 80.55 crore persons presently covered under the Act across the States/UTs. Reservation in PDS Licenses – The State Governments issue licenses for operating FPS under the provisions of TPDS Control Order 2016. The scheme for distribution of highly subsidized foodgrains through the PDS is focused on the poor and deprived sections of the society. The State Governments have been requested to follow the reservation policy for the SC/ST or their group/organizations while granting license for FPS. Amendments to the Legal Metrology (Packaged Commodities) Rules, 2011– Provision for displaying prescribed declarations under Packaged Commodities Rules for selling goods on e-commerce platform. Declarations under Packaged Commodities Rules, in case of food items, have been aligned with declarations to be made under FSSAI, except 3 declarations required under Legal Metrology viz. MRP, Net-quantity and Consumer Care details. The size of words and numbers for mandatory declarations has been increased so that a consumer can easily read. The provision on dual MRP has been made clear by the explanation – “No person shall declare different MRPs on an identical pre-packaged commodity by adopting respective trade practices or unfair trade practices as defined under Consumer Protection Act 1986. Testing of net quantity and its declaration has been made more scientific in the interest of industries. Relaxation regarding change of MRP of Packaged Commodity due to implementation of GST – On account of implementation of GST w.e.f. 1st July, 2017, there may be instances where the retail sale price of a pre-packaged commodity is required to be changed. In this context, we have allowed the manufacturers or packers or importers of pre-packaged commodities to declare the changed retail sale price (MRP) on the unsold stock manufactured/packed/imported prior to 1st July, 2017 after inclusion of the increased amount of tax due to GST, if any, in addition to the existing retail sale price (MRP), for three months w.e.f. 1st July, 2017 to 30th September, 2017. Declaration of the changed retail sale price (MRP) shall be made by way of stamping or putting sticker or online printing, as the case may be. It is also clarified that ‘for reducing the Maximum Retail Price (MRP), a sticker with the revised lower MRP (inclusive of all taxes) may be affixed and the same shall not cover the MRP declaration made by the manufacturer or the packer, as the case may be, on the label of the package’. Use of unexhausted packaging material/wrapper has also been allowed upto 30th September, 2017 after making the necessary corrections.